Rivers State Governor, Nyesom Wike has described leaders of APC in the state including his predecessor and Minister of Transport, Rotimi Amaechi, as agents of lucifer and Chamelon. In a statement released via his media aide, Wike berated the party members for misinforming Vice President Yemi Osinbajo that they were holding an APC meeting in the state capital, Port Harcourt, only for them to turn around to pretend to hold a Niger Delta Stakeholders meeting. 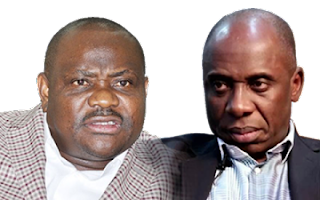 Addressing former Ndoni APC Members led by Ofili Enebeli after their defection to PDP in Port Harcourt yesterday, Wike said that the successful official engagements of the acting President, Yemi Osinbajo to Rivers State sent shivers down the spine of political mischief makers hence they resorted to their usual desperate anti-Rivers politics. "Satan will never sleep. Satan will always be at work. Satan always wants to turn light into darkness. When we held the stakeholders meeting, even the Minister of Transportation was there. But as a you know, a chameleon will always be a chameleon. When you see agents of Lucifer you will know. Just because the Acting President slept in Rivers State and went round our projects, then confirmed that this man is Mr Projects, they suddenly became troubled. Agents of Lucifer in trying to cause confusion, persuaded the Acting President that there will be need for him to talk to APC Members. I have no problems with that. Mr Acting President is a member of the APC. But governance is governance. When they got there, they renamed the APC meeting as stakeholders meeting. Shame , shame. It was not Rivers Stakeholders meeting and it couldn’t have been. " The governor said that it was shocking that the Minister of Transportation Rotimi Amaechi and his associates questioned the award of "Apostle of Peace " conferred on him by the Rivers CAN when they simply divided the Christian Association of Nigeria (CAN) when they had the opportunity. He explained that he remains a man of peace who will never divide families. He noted that he is focused on the delivery of projects, as he has totally shocked the leaders of Rivers APC into oblivion. The governor said that he will continue to play mature politics, unlike the era of Rotimi Amaechi when he repeatedly desecrated the office of the President, refusing to accord Goodluck Jonathan the respect due his office. He pointed out that he accorded the Acting President of Nigeria all the respect due to his office because the state believes governance transcends partisan politics. Earlier, Rivers State PDP Chairman, Bro Felix Obuah noted that the APC leader of Ndoni, Chief Ofili Enebeli defected to the PDP because of the outstanding performance of Governor Wike. In his remarks, Chief Enebeli praised Governor Wike for his exemplary leadership. Over 1000 APC members from Ndoni of the Ogba/Egbema/Ndoni LGA defected to the PDP alongside their leaders.